This chapter focuses on the interventions made by donor organizations at different stages of The Gambia’s local government reform and decentralization policy-making processes in general. It pays particular attention to a community-driven development (CDD) program and how experiences and lessons gathered from this intervention have influenced local government structures and practices in The Gambia. It is hypothesized that, because CDD programs make significant amounts of resources available to governments and communities and their elected representatives, the chance for hands-on experiences and capacity on best community development practices, donors’ development approaches, and functional and institutional arrangement choice influence decentralization policy reform processes in The Gambia. This influence is demonstrated in terms of development approach, council structure, functions, and funding model. Before focusing on the case, the chapter draws on secondary government, donor, and academic literature and personal experiences to explain the nature of the policy processes in a developing country experience in general. 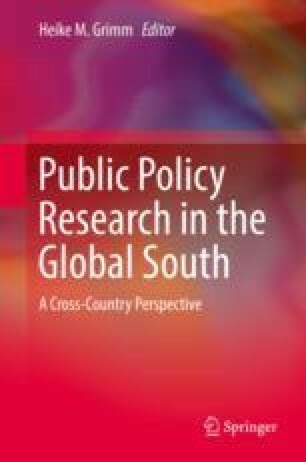 The chapter offers an introduction to the question of what a policy is as well as the origin of policies and the actors that set the agenda and formulate and implement public policies in developing countries.